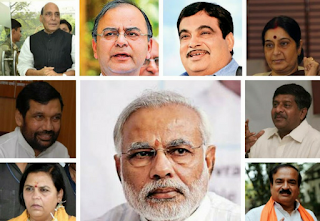 List of Cabinet Ministers of India 2018: The 16th Lok Sabha of India came into being on 26th May, 2014 with the oath-taking ceremony of the India’s 15th Prime Minister Narendra Modi along with other ministers. Modi combined some departments which work in close tandem by bringing them under one ministry, thus reducing the size of the cabinet considerably. Shri Raj Nath Singh Minister of Home Affairs. Shri Suresh Prabhu Minister of Commerce and Industry. Shri D.V. Sadananda Gowda Minister of Statistics and Programme Implementation. Smt Uma Bharati Minister of Drinking Water and Sanitation. Shri Prakash Javadekar Minister of Human Resource Development. Shri Ananthkumar Minister of Chemicals and Fertilizers; and Minister of Parliamentary Affairs. Shri Ravi Shankar Prasad Minister of Law and Justice; and Minister of Electronics and Information Technology. Shri Jagat Prakash Nadda Minister of Health and Family Welfare. Shri Ashok Gajapathi Raju Pusapati Minister of Civil Aviation. Shri Ramvilas Paswan Minister of Consumer Affairs, Food and Public Distribution. Shri Anant Geete Minister of Heavy Industries and Public Enterprises. Smt Harsimrat Kaur Badal Minister of Food Processing Industries. Shri Chaudhary Birender Singh Minister of Steel. Shri Radha Mohan Singh Minister of Agriculture and Farmers Welfare. Raj Nath Singh Minister of Home Affairs. D.V. Sadananda Gowda Minister of Statistics and Programme Implementation. Smt Uma Bharati Minister of Water Resources, River Development and Ganga Rejuvenation. Prakash Javadekar Minister of Human Resource Development. Ananthkumar Minister of Chemicals and Fertilizers; and Minister of Parliamentary Affairs. Ravi Shankar Prasad Minister of Law and Justice; and Minister of Electronics and Information Technology. Jagat Prakash Nadda Minister of Health and Family Welfare. Ashok Gajapathi Raju Pusapati Minister of Civil Aviation. Ramvilas Paswan Minister of Consumer Affairs, Food and Public Distribution. Anant Geete Minister of Heavy Industries and Public Enterprises. Narendra Singh Tomar Minister of Rural Development; Minister of Panchayati Raj; and Minister of Drinking Water and Sanitation. Chaudhary Birender Singh Minister of Steel. Radha Mohan Singh Minister of Agriculture and Farmers Welfare. Smriti Zubin Irani Minister of Textiles. Harsh Vardhan Minister of Science and Technology; and Minister of Earth Sciences.